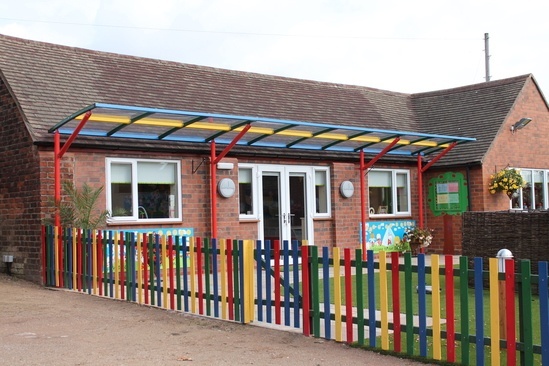 The recently built Ripley Day Nursery approached AUTOPA for a waiting canopy that would protect parents from the rain but also allow the rainwater to run onto existing guttering. They emphasised the importance of a safe yet visually appealing canopy to fit in with their vibrant theme and fun atmosphere. AUTOPA discussed the client's requirements and provided a bespoke service throughout, which included design drawings from approval prior to production. 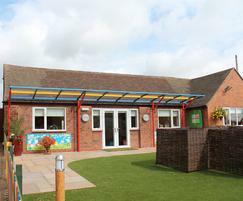 AUTOPA designed a a lightweight freestanding canopy spanning 10m across the entrance of the building which protects parents from inclement weather. 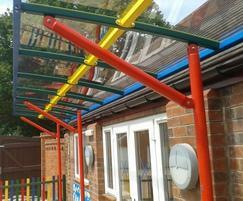 The multi-coloured roof and uprights also create a stimulating and appealing nusery environment for the children. 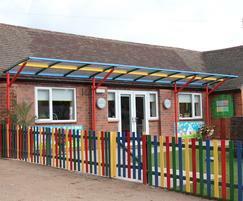 A single legged bespoke cantilever canopy was suggested as this would prevent the risk of children tripping over the legs, making it a safe environment for all. The client was very pleased with the service provided stating "an excellent service was given from planning through to installation". The architects also commented on how the canopy enhanced the building's appearance. 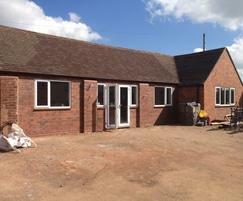 We very much enjoyed working on this project and we look forward to working together in the future.